'Despite the awful pain we will continue to pray to merit soon the redemption of the people of Israel,' Chief Rabbi Lau says after murder. 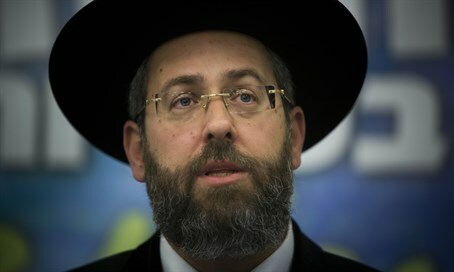 Joining the standard responses of the politicians to Thursday night's horrific murder of a young couple just outside Itamar in Samaria was that of Ashkenazic Chief Rabbi David Lau. The young couple, aged in their thirties, were shot to death by Arab terrorists while driving in their car with four of their children, who fortunately survived the attack without sustaining any physical injury. "Despite the (Sukkot) holiday and its joy, the entire nation is pained and cries at the murder of the parents who were sacrificed in kiddush Hashem (sanctification of G-d's name) just because they were Jews," said Rabbi Lau. The rabbi called on the public to recite Psalms and learn sections from the Talmud in memory of the murdered, and to pray for the peace of the entire Jewish people at this difficult time. He then turned his attention to the four children, aged four months, four years, 7 and 9, who witnessed their parents being murdered right before their eyes. "The tender orphans are the children of the entire people of Israel; we will strengthen them, we will embrace the family and despite the great sadness and the awful pain we will continue to pray and believe that the Guardian of Israel will guard the remnant of Israel, and we will soon merit the redemption of the people of Israel."